During qualifying for the NASCAR Camping World Truck Series JAG Metals 350 at Texas Motor Speedway on November 2, 2018 in Fort Worth, Texas. Photo by Robert Laberge/Getty Images. After a week removed from being locked into the Championship 4 with his win at Martinsville Speedway, Johnny Sauter took on the Lone Star State at Texas Motor Speedway in hopes of carrying the momentum with him. It started out well in qualifying as he ended up winning the NASCAR Camping World Truck Series pole for the seventh time in his career. Unfortunately, his night went sour as soon as the race started. His truck was loose from the get-go and he slipped back several spots. Sauter ended up bringing out the caution on Lap 7 due to a right rear flat going down. Throughout Stage 1, he continued to report on his truck, saying it was “loose center off 1 and 2” and pitting for chassis adjustments. Sauter continued to fight his truck as it continued to get loose and made his way up to 19th after a caution. Ultimately, this is where he would finish for Stage 1. Sauter made adjustments for his loose handling truck during the pit stop. On Lap 40, he was involved in the multi-truck crash that occurred and Sauter collected damage. His night continued to go south as he had another tire go down, this time occurring with a flat left rear. He continued to battle an ill-handling truck for the rest of Stage 2, and wound up 17th. Even with the truck Sauter had, he managed to make it into the top five and ran in the top 10 for part of the final stage. The No. 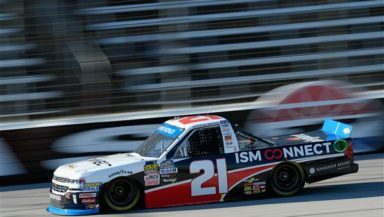 21 GMS Racing team and Johnny Sauter did the best they could, and he salvaged an 11th place finish.